With my family’s growing concern over my bad health in the last few months, they consulted an astrologer without informing me anything. And when i was finally forced to meet the Astrologer, he carefully studied all the possible lines and marks of my both hands, and among many others things, he warned me against stomach ailments and problems in lower regions of the body. Not sure if he had already figured about my stomach ailment from any of my family members as am having one since last few months. Anyway, it’s an easy guess with bongs. But he was right about it. About the lower region, well, he just proved himself right again in the last three days as i went through severe waist pain because of a muscle pull, and somehow survived the worst day of my life. Because after injections and medicines, when getting up from bed, sitting on chair and walking feels like greatest achievements of the day, you know it cant get worse than that. Even as i am joking now that hopefully his prediction doesn’t get any further “lower” as far as my body is concerned, am seriously confused whether to believe him or not. Pain, suffering, loss, danger – they always make us question faith, and sometimes, when there’s no solution in sight, you want to believe anything, at least for the moment, as long as it’s going to make your life easy. Now, imagine this – you are stuck on a boat with a Royal Bengal Tiger in the middle of an ocean. As scary as that sounds, it’s equally exciting and fascinating if someone starts telling the story by assuring you in the beginning that the person on the boat survives. Or better – the person who survives, he is telling the story. That’s the basic premise of Ang Lee’s Life Of Pi, based on a novel of the same name by Yann Martel. The question now is HOW? Ang Lee excels in translating this “how” into a gorgeous journey. 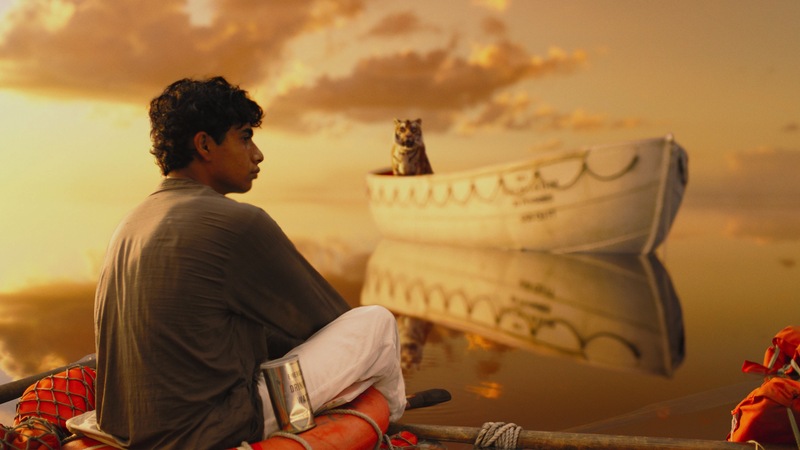 Like me, if you are a fan of Ang Lee and have seen all his films, you must be following every detail about Life Of Pi. 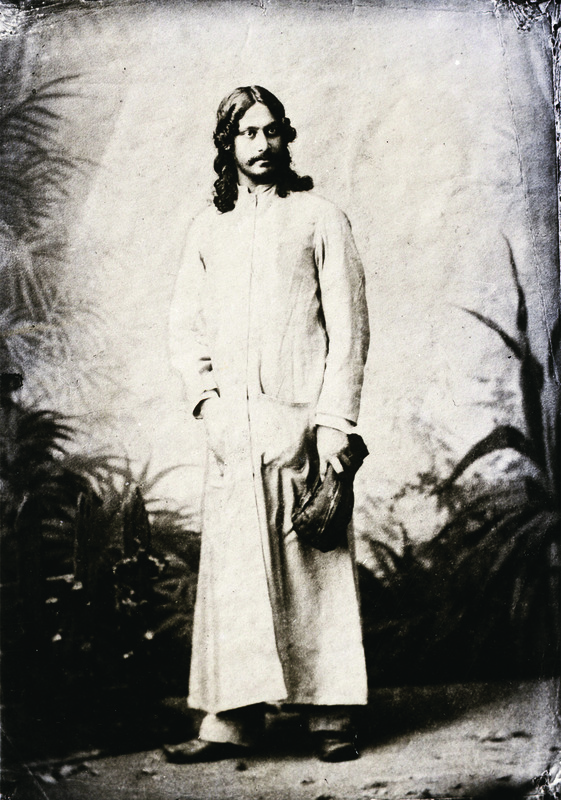 In almost every interview he has confessed that how he was completely enamoured by India’s religious and spiritual collage. And that’s what he tried in the film too – a spiritual journey packed into an adventurous ride. For me, this is where the film fails to connect. It doesn’t go beyond the surface, beyond what you see on screen, beyond the adventure and the exquisite frames. Everything looks fine and so i wasn’t sure what exactly was missing. Something which Terrence Malick translates on screen with those lens flares, hushed voice overs, flickering sunlight and flowing curtains. He holds your hand and makes you part of that “meditative” journey – a rare cinematic space. I was all ready to make that connect with Life Of Pi but it never happened. And when the core of the film doesn’t connect, you start looking at other minor issues – weird accents, stilted dialogues, shifting voice overs. Though i have made peace with the fact that desis speaking English on screen will never look good. But, as was the case with Slumdog Millionaire, when the film speaks to you, it’s easy to overlook other things even when it’s a bollywood masala packed well by a Brit filmmaker. And am not talking about faith in terms of God or any specific religion here. Though the film prepares the ground for it in the first 20minutes, and in the end too. It’s more in terms of nothingness or illusion as he describes in this interview. For me, another interesting aspect that always gets my attention are the books the characters read in films. I always make sure to notice the titles. You see Pi reading Camus and Dostoevsky at such an early age but somehow the dots between life, death and philosophy doesn’t connect. It feels quite vacuous in that sense. As Andre O’Hehir compares it to Cloud Atlas and calls them “spiritual pretensions” in this review. The other big question of the film is which story do you believe? I read the book long back. I started reading it again but could hardly read some 40 pages and then saw the film. I might be wrong here but i think the film completely undermines the second story starting from the opening credit roll which is completely in synch with the core of the film – the balance in nature – between prey and predator. I haven’t seen a better opening credit roll this year (Skyfall should be close second) – it’s so simple and so deadly gorgeous that i could kiss it. The second story would make it dark and with so much money at stake, i doubt any studio would like to explore that. So there’s just one scene in the film that connects to that second story. Does the book have more? If you remember, do comment. Another question that came to my mind after watching the film was how many days he spends with the Tiger? It seems like few weeks. But the correct answer is 227 days! So why doesn’t it feel 227? or did you? Too much of adventure packed in because they need to sell the tickets, and too less of “nothingness”. Make everything look gorgeous, keep them hooked to the seats, let the spectacle sell. Where was the frustration of spending so many days on a boat in the middle of an ocean with a Tiger for company? And it forced me to compare the film with Cast Away. The more i think about both the films, the more i feel i can spend more time with Tom Hanks. Though Hanks’ journey was quite boring compared to Pi’s. But even without stating and underlining every thought with voice-over, Hanks’ story is more meditative, more at peace, more frustrating. Pi is just too much beauty to handle. But do go and watch Life Of Pi because Parker alone is worth the ticket price, and it makes you believe in the magic of cinema and its immense possibilities. That’s how unreliable narrators work, don’t they? Would it have been better if we’d known Keyser Soze was Kevin Spacey all along? True. But here the first story has been loaded so much that there’s no scope for the second one or even the unreliable narrator factor. It kind of defeats it. or maybe i am completely wrong. Spoilers – In Richard Parker’s story, Pi finds a tooth enclosed within leaves of a tree on the carnivorous island . In the alternate story Pi tells us that he is unable to hold on to a turtle and the cook punches his face, dislodging one of his tooth . Is that mentioned specifically in the book too? No i don’t remember that reading in the books. I can’t see how trying to balance both stories equally would have worked for the film. It can obviously work in a novel, but in the film it would have lost the charm of the entire revelation, climax etc. But the film definitely believes in the second story which in turn I believe justifies the unreal beauty of the first story. When he finally narrated the 2nd story, i looked back at the film and scenes for example where he eats the roots from a island in the shape of a man seemed far more brutal. Holding it back till the end, made it much more effective. Also it’s unfair to compare this to how tree of life was made, this one never tries to be dreamy. Even in dreamy, surreal environments it tries to root itself to reality. The one problem I did have was however, Rafe Spall trying to decode everything for us but then again I read one of Ang Lee’s interview’s few days back (can’t remember where), the reporter asked if he was entirely happy with the film, he said he would have liked to make few things less obvious. Pitfalls of making a 100mil film I guess. This is undoubtedly the best piece I’ve read on the movie thus far.. I agree with everything you say.. I told my friend yesterday that every time they use word “castaway” in the film towards the end, it will make people think about how Castaway does it better..I also told her how Tree of Life was also gorgeous and at the same time went beyond that.. You put it superbly..
Also the thought that resonated was the second story.. That’s why I wrote to Masand asking why he described the plot the way he did.. Hated his safe and diplomatic review in fact.. I didn’t even like it when the Canadian author spoon-fed the parallel.. It should have been left to us to draw the parallels and think.. But I’m still shocked that people rate this as the best 3D.. I think Hugo takes the cake any day.. At least PVR Ambience in Gurgaon seemed too dark.. They have the digital projection system.. Don’t know whether that had a role to play..
i really like how you put this movie in perspective, moifightclub. I agree with everything you said. I love Ang Lee and I’ve enjoyed the beginnings and the ends but with Pi although it started well, it ended like a happily-ever-after. it felt like i returned from a lengthy sunday mass held in a beautiful church. I wanted to yell “dont tell me what to think! !” throughout this movie. Your’s is the best review so far, fearless and perceptive. more power to you! You said it! Just saw the film, came here and read it to realize I felt exactly the same. No moments to hold on to…cutting away too quickly. I think Ang Lee wanted us to take the leap of faith but didn’t take it himself. He just didn’t have enough faith in the meditative quality of the story (or he was forced to abandon that faith for whatever reasons of commerce) and hence stuck to creating drama at every juncture. The journey felt covered in milestones only. Even Pi’s hallucination looked so hurried…same sequence in Malick’s hands (or even Tim Burton’s…’cos the film kept me reminding me of Big Fish) would have been a spectacle. And as far as i remember, the book didn’t have that much gyaan on religion/spirituality even. In my memory it was the story of an unusual adventure and immense loneliness. Nothing of that came through except in a couple of sequences. There was more symbiosis and awe of man with (green) nature in ‘Eat Drink Man Woman’s opening sequence where the chef is cooking the huge meal than in this entire journey. Camus’ Meursault and Dostoevsky’s Raskolnikov face the same philosophical questions of crime/morality/redemption that Pi had to face on this journey (hint: cannibalism). The shots of the young Pi reading those two books aren’t so unconnected after all.